If you haven't yet pre-ordered the iPhone 3G S from AT&T, you might be looking at a delay of 1 to 2 weeks before the device is in your hand. 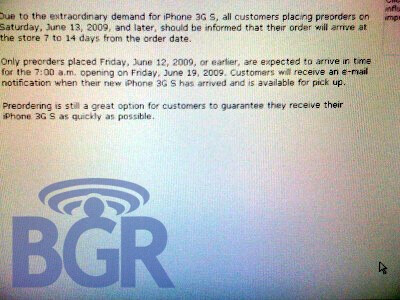 BGR heard from a source and then was sent a screenshot that apparently tells the carrier's reps that pre-orders of the new iPhone received Friday June 12th or earlier will arrive on time to make the 7 am opening on launch date, June 19th. Orders placed after the 12th will arrive at the store within 2 weeks and customers will be notified by email when their handset has arrived. Just like the service... DELAYED!!! LTE w/MIFI FTW!! The pre is the best phone ever. Who cares about the i-phone. 9.9 on reviews. BAM!!! Whatever, you obviously haven't even really used one. I own a pre, and it is by far the coolest phone I have ever used. Including the i phone, including every BB in the world, and every gay LG touchscreen you can imagine. THIS PHONE IS THE BEST PHONE TO DATE!!!!!!!!!!!!!!!!!!!!!!!!!! Enjoy your glorified Centro there buddy, that new phone sheen will be soon gone and you will realize how bad youve fallen for the latest Treo 700. 9.9 means there has obviously been some money/goods exchanged between PA and Palm. Its sad how much of a tool this site is for the corporate interests and not the end user. OH NO! 2-3 more weeks of my iPhone 3G... You mean I have to sit here with this old phone that is strangely EXACTLY THE SAME as this new one I'm waiting on? Man! That's ridiculous, I want the new model of the same thing NOW! E.N. you work for ATT, don't you? That is the only way that you could be lame enough to sit around and talk up ATT all day...what a weiner. Yes, though that does mean that I am at work. I don't really know what your last sentence meant, but no I don't work for AT&T. I don't think that I have to work at AT&T to have common sense. I mean the preordering thing was pretty ridiculous. It seems like everyone likes "bullying" AT&T just for the fun of it and it gets pretty annoying when the complaints are stupid. A lot of the complaints are legite but a lot are so dumb like the comment posted by The Doc. And I also think it's annoying when people over-glorify a phone saying it's way better than this or that. I mean 9.9/10? You have to be joking me. No doubt that the pre is a good phone but the hype is because its new and everything else has been out for a while. If the phone is that close to perfect I don't see any reason why you'd need to change your phone anytime within the next 3 years. I had much more to the comment above but anyways 9.9/10? Seriously??? That's being a little too optimistic. If the palm pre is that close to perfection then there wouldn't be any reason why you'd want to change phones anytime within the next 3 years. I concurr, it really is that BIOTCHIN of a phone. And FYI, not even working wireless and actually getting on this site seriously does make you such a loser. No offense, but come on guys, on your free time checking out wireless sites...E.N....boom roasted!! !